Ahead of this year's celebrations marking 45 years of solid bilateral relations, Mongolia and China signed a strategic partnership aimed at lifting their mutually beneficial partnership to a loftier level in key economic areas. Combined with an acclaimed new investment law that provides investors with greater protection, at least $50 billion foreign direct investment is expected to flow into the resource-rich country Mongolia over the next decade. Located on China's northern border, Mongolia is experiencing an economic boom thanks to its vast mineral wealth. Huge deposits of coal and precious metals including gold, copper and aluminum have caught the eye of leading international investors in recent years and this race to exploit its lucrative resources has transformed the country of three million people into one of the world's fastest growing economies. The importance of mining to the Mongolian economy and socioeconomic development cannot be underestimated. The sector generates around 90 percent of GDP and China receives around 90 percent of its neighbor's mineral exports. Earlier this year, Mongolia unveiled ambitious plans to construct an international standard narrow gauge railroad across its border to enable government-owned mining giant Erdenes Tavan Tolgoi JSC known as ETT - headed by experienced Executive Director Batsuuri Yaichil - to move millions of tons of coal per year to a port in its largest trader partner via rail rather than road. "Our relationship with China is developing rapidly, specifically in the economic sphere," stated Norovyn Altankhuyag, prime minister of Mongolia. "During my official visit to China in 2013, we reached major deals that will strengthen this relationship. We have reached an understanding that in the long term we will provide coal and will cooperate in infrastructure. "The most important deals were long term coal supply and infrastructure cooperation. We will cooperate on building a coal-to-gas plant and the final product will be exported to the Chinese market. The overall investment equals to more than $20 billion, which does not include construction costs." While acknowledging the impressive pace of his country's economic growth has slowed over the past couple of years because of external factors including falling commodity prices, Prime Minister Altankhuyag is confident that new measures aimed at capturing fresh FDI will be a success. "The economic results of 2013 show the price of our main export product, coal, decreased 30 percent on the world market," he added. "Even though we have challenges, our economy is still growing at more than 12 percent a year. Inflation in 2012 was almost 14 percent, and in 2013 it was 10.5 percent. "For 2014, priorities are to sustain economic growth and to reduce the inflation rate to single digit figures as well as support the export industry and the import substitution sector." Minister for Mining Davaajav Gankhuyag is playing a leading role in the administration's bid to substantially increase the minerals and energy sector's contribution to the country's socioeconomic development. "Over the past year, the mining industry, which is the key sector for our economy, has developed in a sustainable way on a long-term basis," he explained. "This year will be the start of the biggest project in our country; it will be a historical moment in our relationship with China." Focusing on other areas of progress and success, Prime Minister Altankhuyag said: "The construction sector has doubled and we have made significant achievements in road construction. "We have completed roughly 1,800 km paved roads, almost equal to the existing paved roads in Mongolia, so a sizable achievement. 2014 is the year of 'Made in Mongolia' and the year of creating and producing. We have big projects in housing, construction and roads taking place. "However, most of the materials used for these projects are imported from abroad, so the goal is to create these products domestically. The government supports this initiative to increase exports. "Such agricultural products as cashmere, wool, skins and good quality meat and milk should be produced in Mongolia. The second important aspect will be to export not just final mining products, but to build the processing industry as well." Highlighting the progress made through the introduction of new legislation centered on attracting foreign investment, the senior politician concluded: "Last year, Parliament approved a new investment law which is very understandable to investors and is characteristic of a predictable and stable investment environment. "We have established Invest in Mongolia, an agency that provides market research and registration support to investors on all levels. Invest in Mongolia has improved the investment environment and we have also passed a new law on securities and investment funds. We have done many things over the past year to create a helpful and friendly environment in Mongolia." The public and private-sector drive to construct new infrastructure aims to boost Mongolia's appeal to foreign investors and highlight the country's main competitive advantage as a "transit corridor" for goods, services, people and communication between Russia and China. Other key competitive advantages in its human resources include a young and hard-working labor force, agility of decision-making and long history of resilient people. Saikhanbileg Chimed, chief of Cabinet Secretariat, said his country's close proximity to China's massive consumer market is a solid foundation for future growth and emphasized that a greater commitment to better transparency in the government's decision-making process will facilitate major international investment from China and other countries. "Transparency and predictability are very important issues for investors, not only when dealing with neighbors but with everyone," he stated. "Transparency is the best guarantee that we can give to stakeholders and investors so they can make the best decisions. "All these negotiations and agreements [with China] are based on transparency issues and win-win situations. Mongolia is the most economically efficient route between Russia and China and that's why infrastructure development is a priority not only from the Mongolian side but also from the Chinese and Russian part. This is the 'new Silk Road'. "Mongolia is a resources country and some people thought in the past that we could do it without the FDI, that we didn't need the foreigners to unlock our potential, but now we are shifting 180 degrees and we are open to foreign investments," Minister Chimed added. "The new investment law does not distinguish between foreign and local investors; they are all treated equally. The registration and bureaucratic system has also been simplified. These measures send the message to investors from all over the world that Mongolia is the ultimate place to invest. "The government has adopted several resolutions for public private partnerships and is looking for collaborations with the private sector as it is very important to involve them." Mongolia's banking and financial services sector has undergone a rapid transformation over the past decade so as to keep pace with the huge flows of FDI and the general rise in living standards and disposable incomes as all this FDI trickles down into the wider economy. A full range of financial products is available, giving forward-thinking firms like leading insurance provider ARD Insurance Company ample opportunity to expand and build market share. An architectural consulting company specializing in innovative designs of commercial and residential buildings, Izmone combines premium quality materials mainly imported from China with sophisticated techniques in cutting edge design. Given the huge growth in Mongolia's construction industry because of the nationwide infrastructure building program, Izmone expects business levels to continue to increase exponentially in 2014, both on private and public projects. Izmone works closely with Chinese enterprises across the supply chain, as O. Amartuvshin, CEO of Izmone, explained: "We have business partners in China that are manufacturers, around 75 percent of the construction materials we use are imported directly from China. "We now want to focus more on collaborating with China to manufacture the materials within Mongolia and sign a distribution agreement with them. We know what we need, we know what materials are good so we want to manufacture in Mongolia and then distribute the materials locally. "China is a major manufacturing country and also our main business partner, so we want to work with China in areas such as know-how, technology, investment and manufacturing. We welcome Chinese investors and business partners and invite them to work with us. 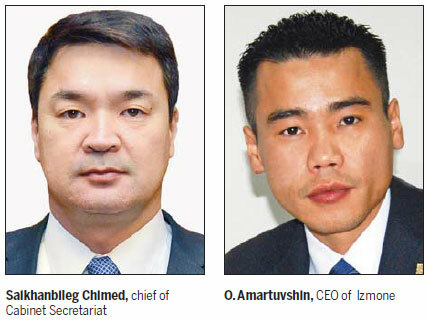 We are a young company but one that does a lot in the construction business in Mongolia." Amartuvshin is eager to highlight the many business and investment openings available to foreign investors in his country - not just in the construction sector - and said the government has put its words into action through the funding of massive infrastructure projects. "For the past few years, the Mongolian government has been a very strong supporter of the construction, mining and road sectors, which is why these sectors developed so rapidly," he said. "The customs tax for certain businesses is now zero and the government is also supporting value added products so we need to focus on manufacturing within Mongolia and then get a distributor license as many businessmen don't know much about the business itself. "Izmone are the real professionals of the sector and so we should do the manufacturing and distribution of construction materials here. There is a demand in Mongolia for this sub-sector and room for profit."